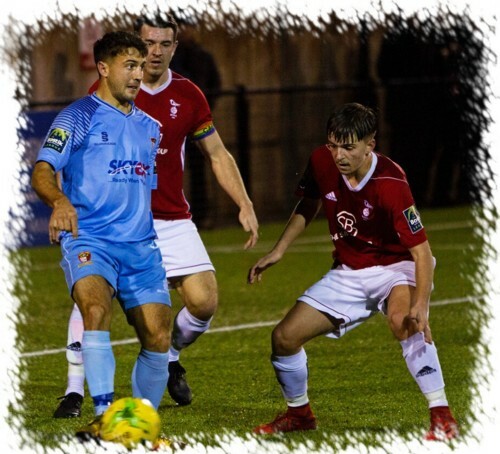 Hayes & Yeading came away from Larges Lane with a point from a 3-3 draw with fellow title chasers Bracknell Town in a game that saw the lead switch one way then the other then back again until we ended up all square at ninety minutes with a deserved share of the spoils to each side. United made two important but enforced changes at the back as newly signed ‘keeper Andrew McCorkell came in for the injured Jack Smith with right wing-back George Ademiluyi starting in place of another injury victim in the form of Tom Jelley. United however could not have got off to a better start, taking the lead pretty much without the ball entering our half. Virtually straight from the kick-off United moved forwards and when the ball reached Scott Bridges just inside the Robins area, a rash challenge from behind sending the midfielder tumbling with referee Ablitt pointing to the spot. Skipper Scott Donnelly stepped up and despite Robins ‘keeper Mark Scott going the right way, Donnelly’s kick was too powerful and United had a first minute lead. 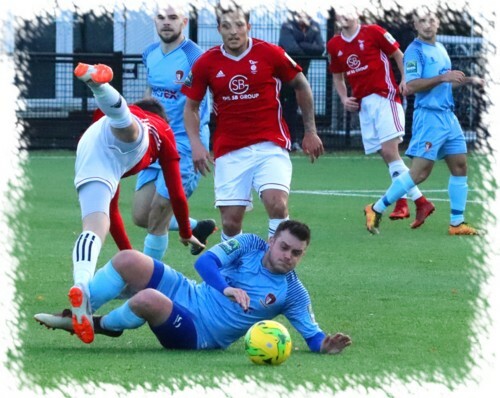 The lead was almost doubled just two minutes later when Donnelly headed the ball on to Toby Little who in turn picked out Josh Chamberlain in the box, the midfielder firing across Scott on the turn but agonisingly wide of the far post. Twenty minutes passed without much of note at either end but at this point in the game the home side drew level as the ball was worked across the United box by former Hayes FC youth product Adam Cornell to Seb Bowerman who struck a shot from 20 yards out that flew past McCorkell into the roof of the United net. Six minutes later McCorkell provided the visitors with a second, the debutant United ‘keeper playing the ball weakly towards Priestley Farquharson with Bowerman nipping in to tap the ball home from ten yards out. Manager Paul Hughes reacted immediately to going behind by making a tactical switch that saw the unlucky Chamberlain replaced by another front man in the form of Lewis Toomey. Five minutes later the ball broke to Toomey who tried his luck from 20 yards, his effort taking a deflection straight into Scott’s arms. As the interval approached a loose ball inside the United box fell to Kensley Maloney but Farquharson was quick enough to slide in and block away the diminutive midfielders effort. Scott was to be the wall that stopped United being level at half-time. Firstly the experienced stopper blocked out a Little drive after the wing-back had driven at the box having collected Toomey’s pass and then in stoppage time, Bridges played a free-kick to the far post where Liam McDevitt pulled the ball back from the bye-line with Scott twice saving at point blank range and United went in a goal adrift at the break. United were soon level after the break though, albeit in controversial circumstances as Joe Grant was flagged offside chasing a back-pass from a United player, the ball was quickly put into play from the free-kick with Toomey, Bridges and Lee Barney all combining on the edge of the box before the later fed Little who took a touch and coolly curled the ball past Scott and in off the upright. At 2-2 the game was wide open with chances falling to both sides. Toomey again sent Little away on the left but this time Scott was equal to his driven shot, pushing the ball away to safety before a free-kick at the other end saw former United youth product Joel Jacobs curl a 20 yard free-kick over the wall and only just over the United goal. On seventy minutes Scott held a Donnelly drive after the skipper had collected Toomey’s lay-off, three minutes later however United were back in front. 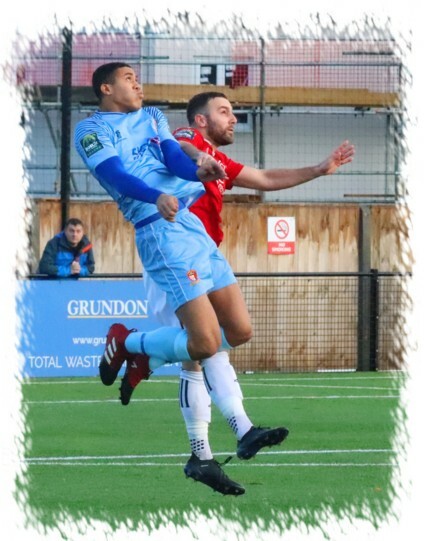 Toomey sprayed the ball across the field to George Ademiluyi, he played it inside to substitute Hassan Jalloh who proceeded to waltz past three or four challenges before firing past Scott from 20 yards out. A double exchange between Donnelly and Ademiluyi ended with the latter’s shot being deflected wide and then with five minutes remaining Sean Moore collected the ball on the right side and made his way towards the United box before hitting a dipping drive from 20 yards that was tipped over at full stretch by a flying McCorkell. Sadly for United, the resultant corner dropped into the six yard box, the initial effort was played off the line by McDevitt but when the ball was chipped back in, McCorkell came and missed with former another former United man, Harrison Bayley, heading home from six yards out to again level the scores. There was still time for a chance apiece in the dying moments though. Ademiluyi broke on the right and again picked out Jalloh inside, this time the United man’s strike went across the face of goal and just out of the reach of the arriving Barney. At the other end in stoppage time, another dipping Moore effort was thankfully too high to trouble McCorkell and both title chasers had to settle for a point although both will no doubt be happy with Hertford hitting a 90th minute equaliser at leaders Marlow. Photos by Ray Peploe (top & middle) and Montimagemedia (bottom).